Painting trim. Doesn’t sound like fun, does it? It didn’t to me. Home improvement projects are one of those areas I have no skills in and my husband and I have to learn as we go. In fact, all things decor and home styling I know nothing about. It’s one of those areas I like to use much more talented friends’ and family members’ brains for. So, as much as I disliked the idea of painting all the woodwork in our home, after consulting with much more talented people we decided to go for it. 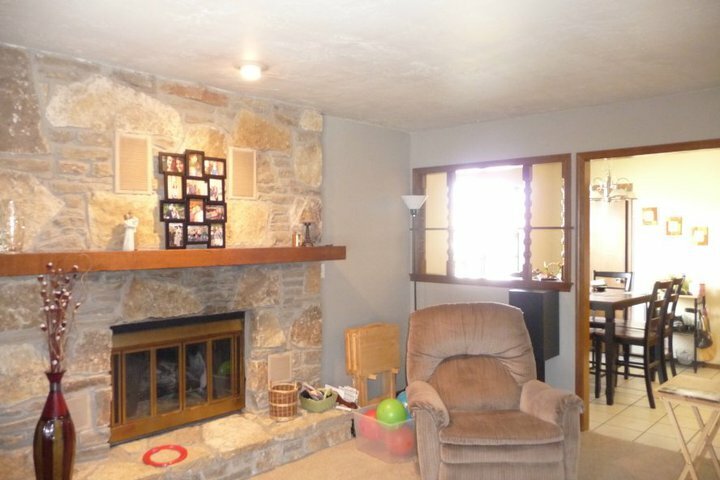 Besides, our house has limited natural light and the original wood trim made it feel darker than it was. 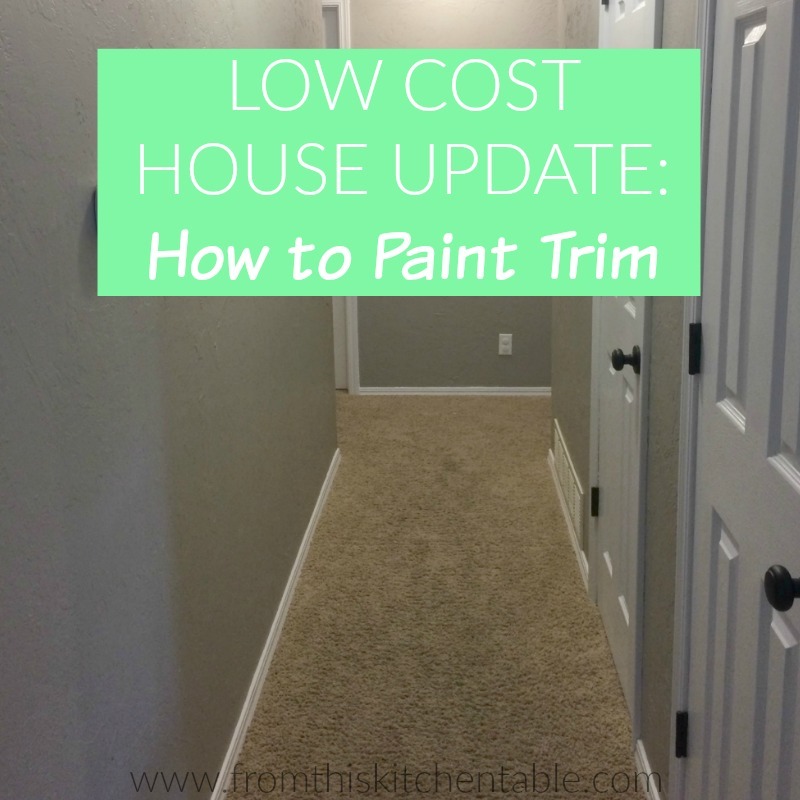 One thing that made the decision a little easier is the fact that it’s just paint so it would be a budget friendly update. So many house updates seem to cost multiple thousands of dollars and since we just finished replacing all our windows, painting trim was a little easier on the savings account. 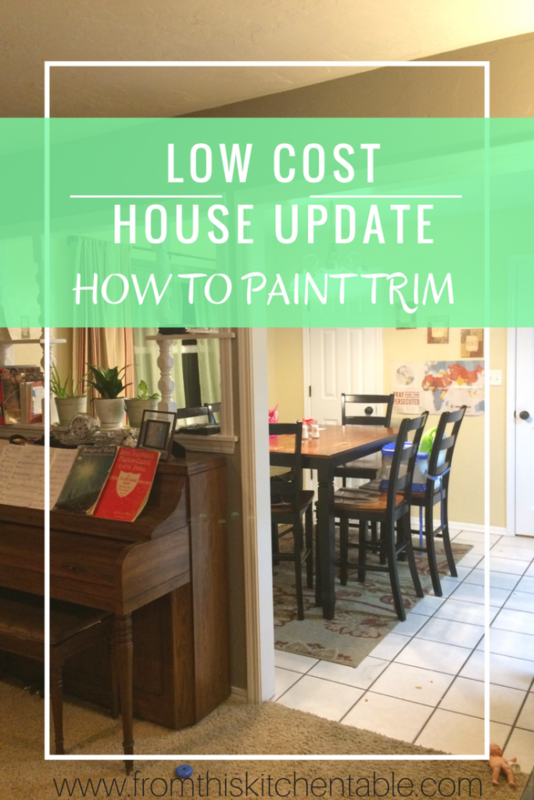 We are newbies when it comes to this process, but I wanted to share what we did and the products we used for painting trim to help you jump start your research. I used a coarse sandpaper and went over all the baseboards, door frames, and windowsills. I used a damp rag and wiped off all the wood. My husband happens to love taping, so he taped all the walls. I can’t stand taping and would rather just paint carefully and wipe off the wall if needed. The problem with tape is that you’ll have more touch up work to do – removing tape almost always leaves some places messed up. We also have carpet in our home so we bought a paint shield/trim guide to put under the baseboard. You can also use it in place of tape around the walls. Two coats of Kilz primer. We followed the instructions on the can and let dry at least an hour between coats. 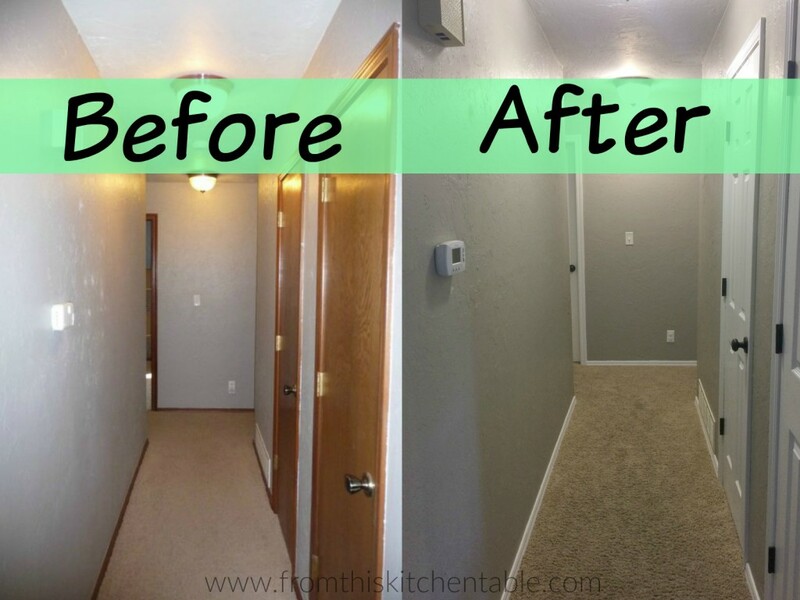 You’ll have to decide if you are going to use an oil based or latex paint. This article goes over some of the differences. We have friends who used oil based and love it and it’s actually more durable. We went with latex simply because the drying time is way less and the fumes aren’t as strong and know that we’ll periodically have to touch up the woodwork. So if you use latex, know that you will have to touch up periodically and also buy the highest grade you can. Going from brown wood to white trim required good paint even after we primed. After returning one kind-of paint (cheaper) and consulting with an employee at Lowe’s, we purchased Valspar Signature. Two coats were needed in most areas. The paint required a longer drying time of 6 hours. I used the paint shield/trim guide and put the metal edge under the baseboard as best I could to make sure to coat the wood well and keep the paint off of the carpet. This is the tedious part because you are so ready to be done. At least we were. And actually, we still have touch up work to do. But after all the painting is done and tape removed (if used) it’s time to go around and touch up the places paint peeled off or got on the wall. Painting trim. With three young children and our regular jobs it was definitely a lot of work and took longer than we wanted. However, now that it’s done, I’m so glad we did it. I even wish we did it years ago. The walls colors pop (and even look completely different in some rooms) and our home is so much brighter. You might have noticed from these pictures we also updated our doors. I’ll cover that in another post and share how my husband did that project. Do you enjoy painting? Do you have any tips to share as we move on to our next house project (most likely the bathrooms)? This entry was posted in Home on April 4, 2017 by Deanna Michaels.